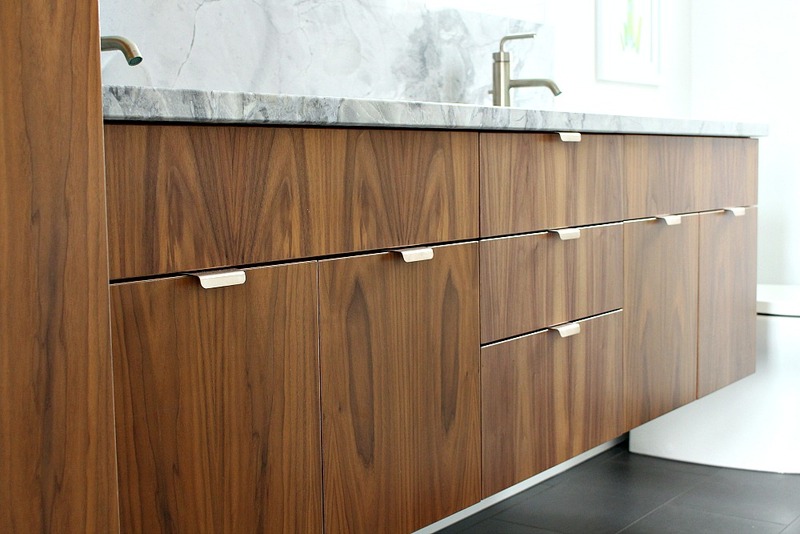 Today I’m showing you our new mid-century modern inspired, contemporary edge pulls for the bathroom cabinetry. I feel like I’m doling out little morsels of bathroom reno updates at this point, but I know you’re all curious to see progress in the most drawn out bathroom makeover ever! Instead of making you wait for a big reveal (which is still at least a couple of weeks away because I’m having a tough time with my shower curtain hack and am waiting on some fabric samples), I’m sharing little updates as we finish them. You might remember that we had a little bit of trouble with our walnut cabinetry in the bathroom. There was a long scratch on a drawer front so a replacement set was ordered – but there was a nearly identical scratch on the second set as well. We think that it happened in the manufacturing, like maybe a machine grabbing the veneer on an assembly line was scuffing it. It’s difficult to get irritated because it’s Canadian made and purchased from a local shop – I’m always much more patient with manufacturing problems when jobs are kept in Canada or the States. With weeks stretching on between the delivery of each set of drawer fronts, I was getting a little antsy because I was so excited to affix the hardware! 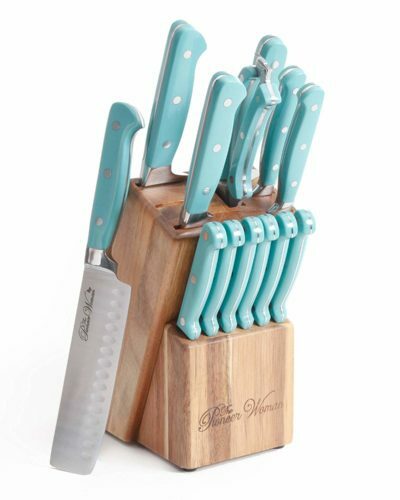 The cabinetry place was so helpful though, and they tried to fix the second set to save us the hassle ordering a third, but the scuff was beneath the finish, so a third set was ordered anyway. They recently arrived, scratch-free, although the manufacturer didn’t drill the holes exactly right so they are misaligned by a few millimeters. Oy vey! We’re not the gambling type, so we’re sticking with these! They’re also a smidge lighter than the rest of the cabinetry but I think they will darken up once they’ve been exposed to the same light. But really, I only notice these things when I’m zoomed in taking blog photos. Day to day, these minor imperfections are nearly imperceptible. We found the perfect pulls with a mid-century modern feel and a brushed finish that matches the Kohler vibrant brushed nickel perfectly. 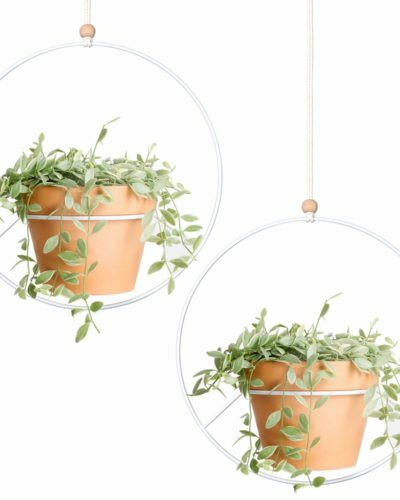 I first spotted the “Contemporary Antimicrobial Edge Pulls” from Richelieu in a showroom and although I spent a few months pouring over various hardware options, I couldn’t find anything I loved as much as these. You know how it is, when you keep comparing everything you find to that first, perfect thing? These contemporary edge pulls became the yardstick and I decided to just get them. Hubby’s Dad is a woodworker so I asked him to order them from because he gets a trade discount. I couldn’t see prices online and I nearly fainted when I realized they would still be about $250 (for 11 pulls), but I was committed! It seemed silly to buy cheap hardware when the other finishes in our bathroom are high quality. The pulls didn’t disappoint! They are so pretty and coordinate so well with everything else. I know metal mixing is on-trend, but I find it distracting – especially in small rooms like our bathroom. 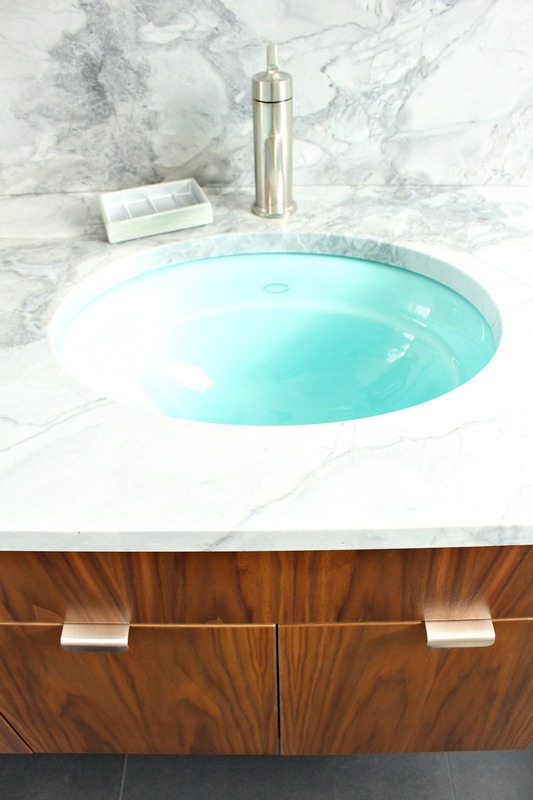 There is already so much to take in, like the cheery aqua sinks, stunning quartzite stone and busy walnut grain. 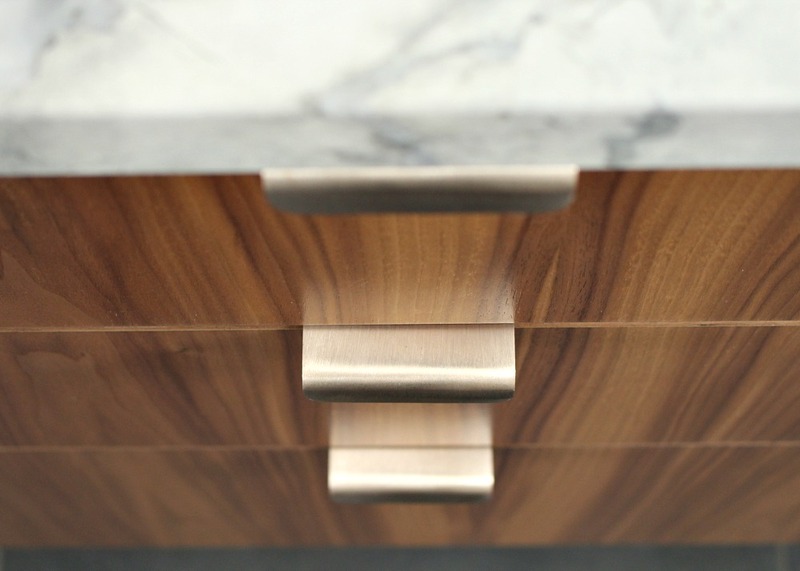 These contemporary edge pulls are simple and un-fussy, but make the whole vanity area look pulled together and polished. Before installing them, we taped them in place and experimented a little, finding the most comfortable and natural way (for us) to open everything. After living with awkward pulls in the townhouse kitchen (smack dab in the middle of the cabinets! ), we’re super careful with hardware placement! We walked with our eyes closed around Lee Valley when we bought the lakehouse kitchen pulls, trying to find the comfiest pulls. We spent two days pondering placement here, but finally decided to put them in the middle of the drawers and cabinets on the vanity for uniformity, and then place them vertically on the linen tower because that felt the most convenient. It’s truly amazing how much time figuring out these little details takes. 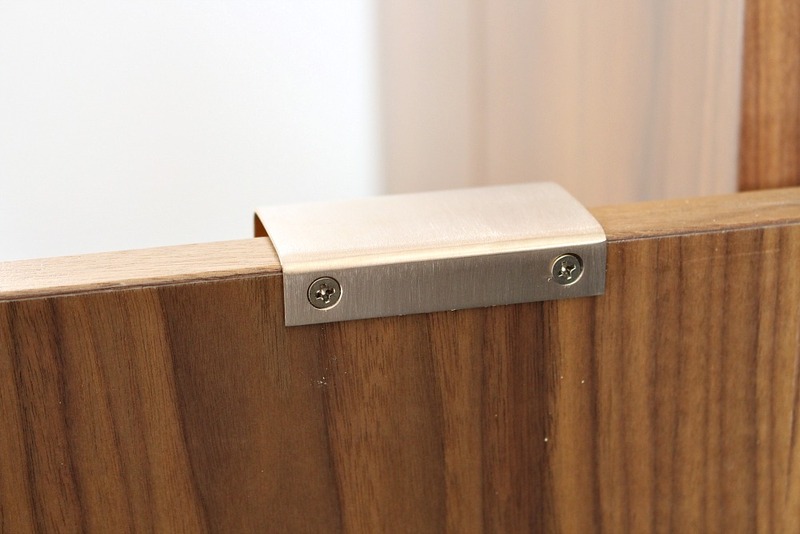 I’m also seriously impressed with how long I’ve been able to ramble on about these contemporary edge pulls. 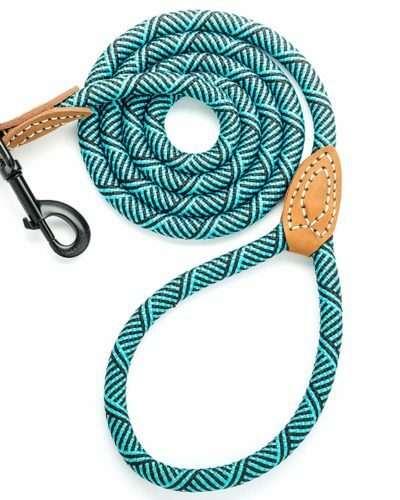 If you like the look of these contemporary edge pulls (but not the price), I did find a similar, less expensive Richelieu pull on Amazon. 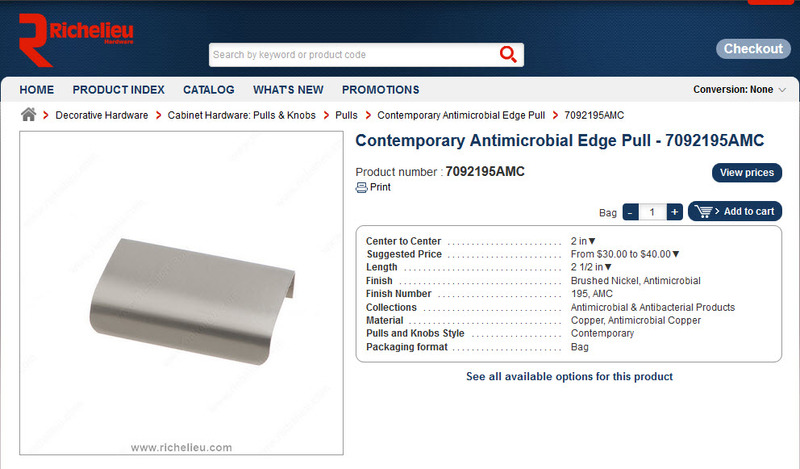 This Contemporary Edge Pull is about $11 for two, and it comes in stainless or aluminum. UPDATE (January 2019): After living with these pulls for two years, I no longer recommend them. They developed an ugly, water-spotted patina from minimal use. I will take some updated photos and share them soon. GET OUT! where have these been all my life?!?!?!? So happy you love them! 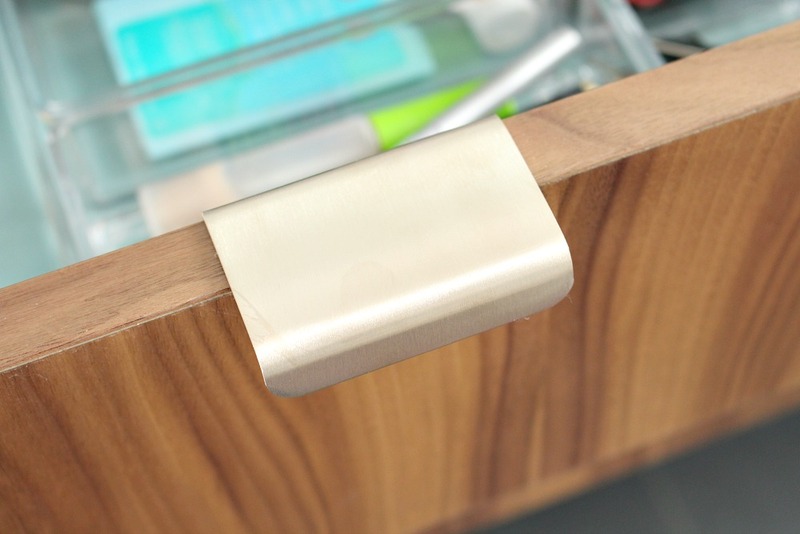 Sadly, they don't come in brass, but there's a narrower pull of the same style that comes in chrome, matte black, or black:http://www.richelieu.com/ca/en/category/decorative-hardware/cabinet-hardware-pulls-knobs/pulls/contemporary-metal-edge-pull-3966/1005404?s=contemporary+edge+pullI could see you doing a stunning dresser makeover using these. Everything so far looks truly stunning! Thanks Patricia! We're really close and it feels amazing. It's so weird to pick out these things months ago (some of them a year ago) and see them now and think, "oh yeah… I remember you," lol. But it's nice, like a present from my past-self. ooooh, I love them! Definitely worth the splurge. Thanks! I will admit that the quality is really nice, so it was worth the price. Nice! They look great and suit the cabinet/bathroom perfectly! Thanks! I'm so happy with them! What a racket, right? How do we get into the hardware making business… In all fairness, I think there's a bit of shipping worked into that total price, but it was a pretty small box! Those are REALLY nice!! And such an amazing price. Definitely a good choice for a kitchen, where you'll need more and the cost really add up quickly. Thanks for sharing! I don't have an Ikea in my city so I kind of tune out Ikea but I'm flagging those for later. Someday I want to do Ikea cabinets in our "fish room" to create a studio space but I'll have a teeny tiny budget and those will be perfect. Now that they're all installed, I love our cabinet fronts too. I really waffled about doing something lighter (like white) or light reflecting (like a beachy acrylic) but the walnut is the right choice. The grain kind of sparkles in some light! LOVE the staggered pulls on the linen tower! What a great job you did!!! Perfect choice i will be happy to suggest to our clients whom may not like the drawer pulls on certain pieces of furniture we have! 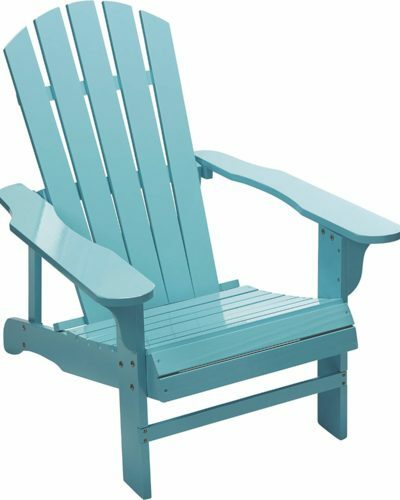 (www.rusticfurnitureoutlet.ca). 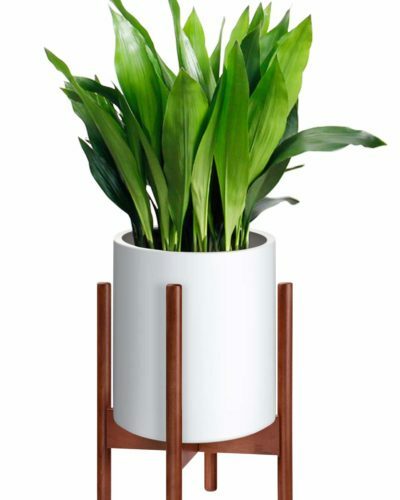 But like with everything you get what you pay for… that company offers a lovely finish and rigidity of the handles which may not be found anywhere else. Thanks! I've replace hardware on furniture before and it's a great way to customize a great piece and make it feel even more special. Hi, where did you get your wood vanity? 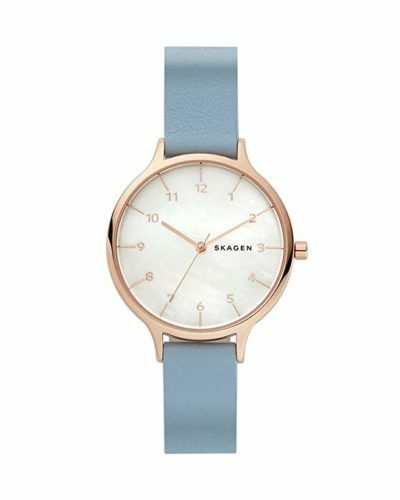 I would love to get one similar and don’t know where to start of how much they cost. Thanks! 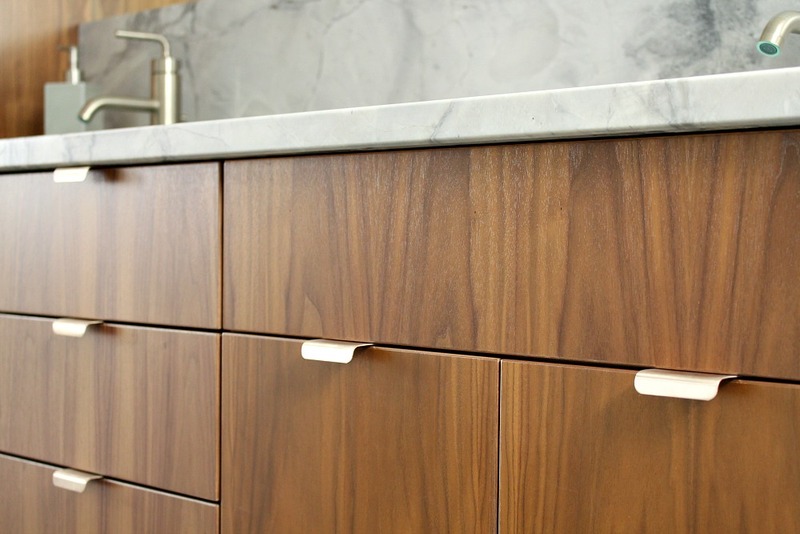 Hi Johanna, it’s by AYA Kitchens, so it’s technically kitchen cabinetry. I worked with a kitchen/bath designer from a local company to get the right sizes to fit. 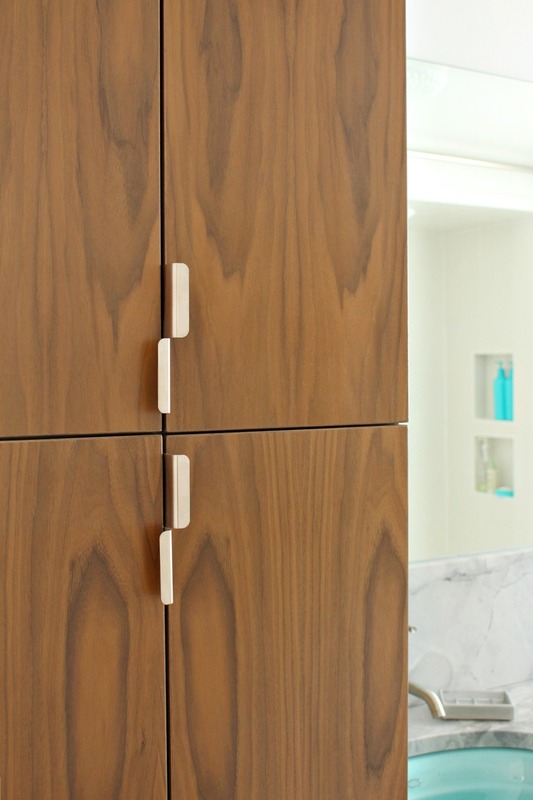 You could also try IKEA and something like Semihandmade for walnut fronts. But I suggest that you check local kitchen and bath places for cabinetry. If you go in with measurements, you can easily get a quote. 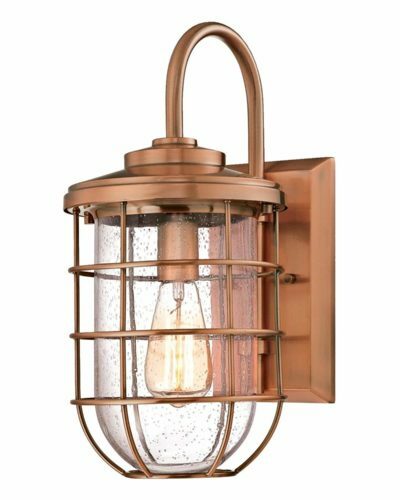 I shopped around to a few home improvement places before ordering.